We have an extensive range of health products to keep your dog or puppy healthy at Nature's Best. From satisfying and tasty treats that focus on maintaining good oral health and freshening your dog's breath, to strong mouth washes and safe ear cleaners, you can ensure that your furry friend is always feeling their very best. Vet's Best advanced oral health products are made with natural ingredients for a healthy mouth and fresh breath with various methods to make it a more pleasant experience for both of you and your dog. Vet's Best Dental Care Kit provides owners with toothpaste and toothbrush for the best dental care. The veterinarian-formulated toothpaste contains enzymes and natural ingredients to clean away plaque and tartar, while the triple-headed toothbrush efficiently cleans teeth from every angle simultaneously. ​Vet's Best Clean teeth Finger Pads provide an effective way to clean your pet's teeth and maintain good oral hygiene. Regular use will help in reducing plaque build-up and promote fresh breath. This specially designed pad allows the pet owner to be guided by their own touch when cleaning their pet's teeth. Vet's Best Breath Freshener has been specially formulated to practically tackle sources of bad breath. Simply just add to water to deodorise your dog's breath with natural anti-bacterial agents. Vet's Best Triple-Headed makes brushing your dog's teeth quick and convenient. The three bristle heads are positioned to form around each tooth, efficiently cleaning from every angle simultaneously. Whitens teeth overtime with correct use. Protects gums and prevents gingivitis. Freshens breath and reduces bacteria in water bowl. Dental Fresh is a safe and effective water additive that works to improve overall oral health for dogs. It helps to strengthen teeth by restoring enamel, protects and prevents gums from gingivitis, fights periodontal disease, and results in fresher smelling breath. Simply add one capful of Dental Fresh to your dog's drinking water each day. Improve your dog's overall oral health and clean their teeth with Hartz Chew 'n Clean Bone dog toys. Features a variety of different textures for a satisfying chew that gently massages your dog's gums, and includes a delicious bacon flavour that dog's won't be able to resist. 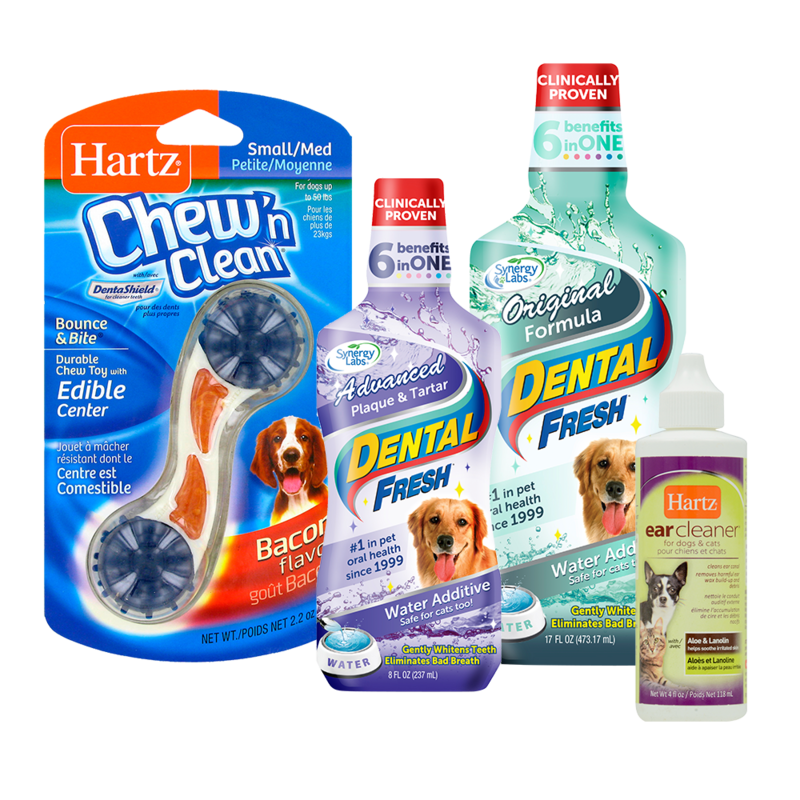 Hartz Dentist's Best Dental Kit supports optimal oral health for dogs of all sizes. With a fresh vanilla-mint flavoured paste, the toothbrush also has angled bristles and neck for a much better reach. Hartz Nursing Bottle for Newborn Animals is specifically designed for an easy feeding session. The bottle is marked so you can easily gauge the appropriate amount while feeding.